The trademark Horseshoe M Brand of the Mangalarga Marchador owned by the ABCCMM. Isabelle do Great Lakes and owner Karen Livesay. Inspected in CO.
Kate measuring Isabelle. 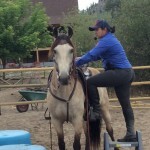 Riding, conformation and temperament are evaluated. Bill and Sandy Dory arriving from AB. The Inspection and Open House in BC, Canada. Kate measuring Valentim during inspection with Dana holding her. Flying Oaks Valentim-Beijo with Kate Barcelos on the left and Dana Johnsen owner on the right. Kate mounting Sapphire (sp) and Barcelos, ABCCMM at the BC event. Owned by Gena Rome. Flying Oaks Athena and owner/rider Sandy Dory at the BC event. Flying Oaks Zeus, MM gelding. Igor do Lucero coming in with owner Bill Dory. Great to have so many Marchador horses and owners come together! Tory, MM gelding, and owner/rider Sandy Dory at the BC event. Photo by Shannon Ford. Marchador mare Joia owned by Laurie Klassen, ridden by Kate Barcelos in SK. All photos at the BC event by Shannon Ford, published on FACEBOOK. Dr. Kate Barcelos was in Canada presenting her paper at an Equine Conference and stayed on to complete another ABCCMM inspection, the second one in Canada! Dana Johnsen, USMMA Board Member at Large, organized an Open House around the event and Marchadors from Alberta and British Columbia joined in! Additional invitations and participation from people who wanted to see, meet and ride a Marchador. It looked like a great event. Kate also visited other breeders in Colorado, Alberta, British Columbia and Saskatchewan before heading home to Brazil. ABCCMM inspection is a prerequisite for dual ABCCMM (Brazilian) registration. It is not required for USMMA registration.